To fly is an ancient desire of the man kind. Today it’s easily doable. We fly over the landscape silently, without engine. And you can enjoy this experience with us. Our classic flight is for those of you who want to try the feeling of flying and to see the world from different perspective. You will be accompanied by our experienced tandem pilot. The Beskydy, Krkonose or Jeseniky? For sure, the most popular sites for paragliding are in Czech Republic. We have exclusive access for a few starting site which are located in various altitudes and suitable for various wind directions. This fact allows us to implement tandem flights for most of the spring, summer and autumn time in very beautiful mountain range. The Krkonose and Czech Central Mountains offer epic views as well. Especially Cerna hora (Black Mountain) is famous for being thermal active. If the Beskydy are way too far for you, then Cerna hora and Kozakov are the first spots where real flying is possible. The Jeseniky are beautiful but for non-powered paragliding not very suitable. But as soon as the conditions are flyable, we will be happy to fly with you there. Unfortunately local weather does not allow us to make that many flights as our clients want us to do and thus it is necessarily sometimes to change the location of a flight – of course according to your time possibilities. We will put you firmly into the harness and explain to you how to help us with taking off. We will prepare our glider and the rest of the gear. Also we will tell you how to use the sport full HD camera and what are the best way to shoot the whole flight. Then later, we will check you once more, attach you to us and the glider and then we will just wait for the right breeze. Short run, last feeling of the ground and we fly! Nothing that complicated. There is always an official landing place underneath every take off. In the end of the flight, we will approach the landing secotr and focus on the last phase of the landing – touching the ground again. In order to be sure that you will not hurt your ankles during the landing, we will ask you to stretch your legs and put them up to utilise the protector which is under your seat. The glider will fall behind us shortly and you can enjoy the old-new feeling of solid earth underneath your feet. 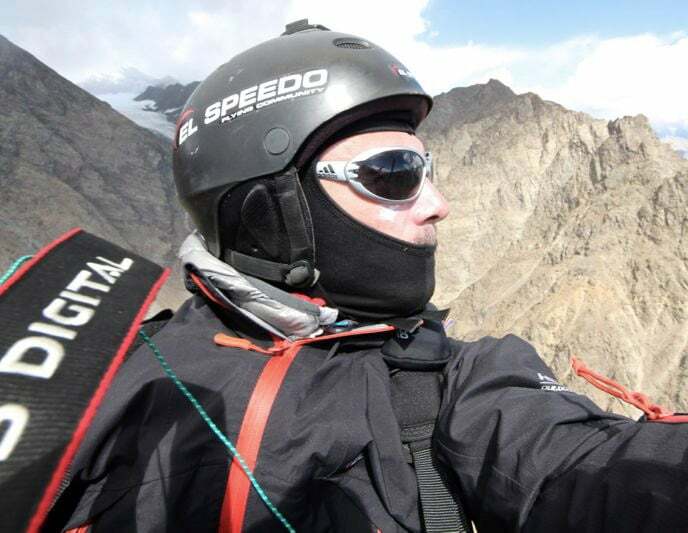 Together with Juraj we were the first paragliding pilots who Achieved K2 base camp. Thanks to strong friendship, pilot experience and quality equipment. And our El Speedo tandem pilots – those are great people who share the same values that give you the best that paragliding offers. That is why we are consistently preparing for every other flight day, your flight, because it is the first for you – unforgettable. Instant adrenalin in a tin cover – that is a funny possibility to surprise your friends and relatives. The gift package of the classic flight contains closed tin can with a T-shirt in it and the gift voucher and further instruction. We will be happy to help you with choosing the right type of flight for you. Both personally in El Speedo office or by phone. From 6 to 12 minutes on average which depends mainly on elevation of the take off and current weather conditions. The duration of flight depends on the elevation which is the difference between altitude of starting and landing spot, then the wind and thermals. Average flight with 500 metres elevation takes around 10 minutes. If there would be a possibility for thermalling and you would love to spend more time flying, just tell the pilot and let us enjoy the Thermal Flight. When it comes to time demandness of the whole trip for this flight, be advised that it takes usually from 60 to 90 inutes. Unfortunately, we do not go a lot for flying to Jeseniky due to lack of good flying days. We need to be ready for moving this kind of flight to Beskydy. We will keep you informed if the conditions would be about to set us back in Jeseniky. – or any other site in the Alps. We can offer this type of flight any time of the year. In Czech Republic, the season begins in march and ends in late october. In the other sites it depends mainly on snow coverage. The flight is usually done with mild wind, up to 8 m/s which of course depends on particular site. Ultimately, we choose the site of your flight by considering the wind direction. – for the flight itself, we recommend you to wear high trekking shoe with fix ankle, long trousers and windproof jacket. It is nice to have sunglasses when the sun is shining happily. Before the flight itself, there is a short preparation including the instructions for landing. We will adjust the harness to your size and try a little bit of running with the harness. If interested, the tandem pilot will explain you principles of paragliding. Then you will be seated and got a helmet. After a short running down the hill, you will be flying. You will be seated in front of the pilot, literally in the first row. The flight itself takes roughly from 6 to 12 minutes which depends mainly on current flying condition. You may shoot your own pictures if you take your camera for flying. However we recommend this option for the thermal flight. It is so much better just to enjoy the view. We offer you to take the pictures or make a video ourselves. Of course, you may invite your closest to watch you flying directly on start or they may watch the landing. The tandem glider is just for two persons, ie one pilot and one passenger. However, if interested, let us know in advance that you would like to start within a group and we will gather our crew to fly with you all! Order your flight by our online form or by phone (+ 420 777 311 661) or personally in our office. You will be told the specific date, place and hour of your flight by your tandem pilot who will contact you in advance. Do not forget to take your voucher with you. Fly with us to the sky!